Happy Birthday to Moo! To celebrate its 5th Birthday, the Strolling of the Heifers (SOTH) is inviting everyone to enjoy their impressive lineup of new activities celebrating agriculture and two of our area's biggest assets -- our farmers and our artists. 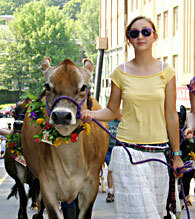 From the beginning, the four-day Strolling of the Heifers Parade & Festival, sponsored by Turkey Hill, has been a unique blend of farmers and artists, culture and cows that captures the essence of what's so special about Brattleboro in particular and the state of Vermont overall. This year, in addition to featuring more flower-bedecked bovine beauties than ever -- over 100 heifers -- the 5th Annual Strolling of the Heifers parade on Saturday, June 3 will feature more farm fresh cuisine, farmers, performance artists and musicians than ever before. The four-day festival began on Thursday, June 1, with the Farm Summit at the Brattleboro Museum & Art Center in downtown Brattleboro. The panel discussion on "Rediscovering the Pleasures of the Table" focused on nutrition and strides being made to strengthen the link between the public and farm fresh local food. On Saturday, June 3, everyone is encouraged to get to Main Street early (9:00 am) to get the best seats. (No dogs are allowed at the parade.) Prior to the start of the parade, entertainment will be provided by ChrisYerlig as Hoopoe the Clown, Dagen Julty as Happy Dan the Music Man and Amelia Struthers as the Stroll's Dairy Godmother. The parade (10:00 am) of 100 bovine beauties, led by 4H-Club members and farmers, will be followed by many wonderful acts, including the Red Star Baton Twirlers, Andover One Wheelers, a Wells Fargo Coach pulled by Belgian draft horses, Quaboag Highlanders Pipe Band and a herd of miniature horses. Turkey Hill's giant cow float will bring up the rear. The Funky Heifer Contest Exhibition of wild-and-crazy cow creations competing for prizes will be on the Brattleboro Common (9:00-3:00). Strolling performers at the Dairy Fest throughout the day will include Happy Dan the Music Man, fire-eater and juggler Robin Zegge, and Yuri, The Prince of Color. For those with an appetite, there will be all sorts of New England farm products to sample and purchase. There also will be a Farmers' Breakfast, sponsored by Organic Valley CROPP Co-operative (9:00-3:00) for just $3.00 per person, with entertainment provided by Larry Lewis on guitar. C&S's Family Entertainment Stage will host performances by the Stroll's Dairy Godmother Amelia Struthers (11:00) and The Annies (12:30). And spectators definitely won't want to miss "Fee Fie Fo Fun!," a hilarious version of "Jack and The Beanstalk" performed by the clown jewels of Vermont, Peter Gould and Stephen Stearns (11:30 am). The Heifer Fiddle Festival, on the Subaru Music Stage (11:00-2:00), will present five of the area's best fiddlers performing half-hour sets. Lisa Brande, whose passion is Louisiana Cajun fiddling, will be accompanied by Mark Trichka on guitar and mandolin; John Specker, renowned as the father of the Ithaca sound, will play with Amos Newton on guitar; Phil Bloch will play jazz violin; Ethan Hazzard-Watkins, one of New England's premier contra-dance fiddlers, will be accompanied by Peter Siegel on guitar, mandolin and banjo; and Nate Paine, who specializes in old-time Appalachian fiddle tunes, will be accompanied by Kevin Parry on guitar and mandolin. Highlights of the Dairy Fest (11:30-3:00) will include a Celebrity Milking Contest on the Common right after the parade, featuring Vermont Congressman Bernie Sanders and Brattleboro's Chamber Person of the Year, Bob "Woody" Woodworth. There also will be a Best Chefs of Vermont Tasting Pavilion, presented by the Vermont Fresh Network. The public is invited to come see cooking demos and savor gourmet samples of signature recipes prepared by: Michael Allen, Deerhill Inn; Arthur Shelmandine, It's Arthur's Fault; Jim Martis, The Putney Inn; Michael Glatz, Red Shutter Inn; and Laurie Merrigan, Capers. On the Heifer Stage, activities will include Heifer songs written and performed by the Brattleboro Women's Chorus (11:15); Funky Heifer Contest Awards (1:00), sponsored by Citizens Bank; and a Farm Fashion Show, sponsored by Carhart and Sam's (12:00 & 1:30). Many of the Stroll's sponsors will have special activities at their booths. Contests for kids will include Staples' Basketball Shootout, the Brattleboro Reformer's Coloring Contest and Stacy Subaru's "Great Moo-Off." Each of the contests will award prizes. Everyone is encouraged to keep an eye out for Turkey Hill's giant cow float where the public will be welcome to get free ice cream from the parade and festival's primary sponsor all day long. A giant ice cream sundae also will be created near Turkey Hill's giant cow float (1:00 pm). The Brattleboro Area Farmers' Market will be at its usual location, on Route 9 in West Brattleboro, after Exit 2 and the Creamery Bridge (9:00-2:00) offering food and special events that pay tribute to local agriculture. The entertainment extravaganza will continue on Saturday night with The Hammys at the Brattleboro Museum & Art Center (6:00-7:45). Stephen Stearns, the emcee for this anything-goes awards ceremony to roast the winners of the Heifer Ha! Ha! Contest, will be joined by actors from the New England Youth Theater who will bring to life the jokes that won the contest. "Artful Jesters," the Museum's special exhibition of humorous artworks by veterans of visual humor, including Red Grooms and Jim Nutt, will be on display for all to enjoy. Following The Hammys, the Strolling of the Heifers will present Shiela Jordan Plus Strings, a Vermont Jazz Center Production at the Latchis Theater (8:00-10:30). One of the Great Ladies of Jazz, Jordan will perform in concert with the Ambassadors of Light Trio and the Brattleboro Music Center's String Quartet. Rolling Stone says Sheila is "exquisitely musical; her timing, intonation and sense of color and line would make her a great singer in any idiom. The emotion that comes through is breathtaking." General Admission: $20, Balcony, $15. For more details, visit www.vtjazz.org or call (802) 254-9088. Those who prefer contra and square dancing are invited to a Community Contra Dance at the Shriner's Hall/Green Street Extension on Saturday evening (6:30-9:30). Andy Davis, who will be calling the dance and playing accordion, will be joined by local contra-dance musicians Laurie Indenbaum on fiddle and Keith Murphy on piano and guitar. People of all ages and abilities are welcome to attend. Admission is $3 for children, $6 for adults and $15 for a family. Students in middle and high school are admitted for free. For more information call Robin or Andy at 257-1819 or e-mail village@dancingmasters.com. Fittingly, the festivities will end on Sunday with a Royal Farmers' Feast at the Chelsea Royal Diner in West Brattleboro (7:00 am-12:00 noon). This gourmet breakfast fit for a king (or a farmer!) will offer a wide array of options, ranging from strawberry pancakes to huevos rancheros for $5.00 to $7.00. This delicious meal, prepared by the landmark diner's chef, Todd Darrah, will be the perfect way to start the day before heading out on a Self-Guided Windham County Area Farm Tour (10:00-4:00). Maps with descriptions and locations of farms on the tour will be available at the breakfast. The farms will host special activities for the enjoyment of young and old alike, including hayrides, petting zoos and agricultural demos. 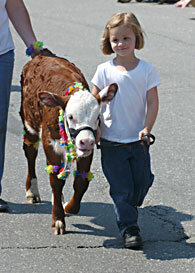 The Strolling of the Heifers' Lead Sponsor is Turkey Hill. Primary Media Sponsors: Brattleboro Reformer and WKVT. Official Car: Subaru Dealers of New England. Gold Level Sponsors: Citizens Bank, Holstein Association, USA, SoVerNet, 101 The Fox Radio. Silver Level Sponsors: C&S Wholesale Grocers Inc., Home Depot, Organic Valley CROPP Cooperative, Price Chopper, Vermont Housing Finance Agency, Walgreens. Bronze Level Sponsors: Brattleboro Area Chamber of Commerce, Brattleboro Retreat Healthcare, Brattleboro Savings and Loan, Building a Better Brattleboro, Business Beat, Costume Ladies,Green Mountain Tent Rentals, Hannaford Superstore, Mount Snow, Redex Industries Udderly Smooth, Stacy Subaru, Stuart Communications, Taste of New England, The Rutland Herald, Trust Company of Vermont, Vermont Agricultural Business Education Center, Vermont Cheese Council, Vermont Water, WTSA, Wendy's.